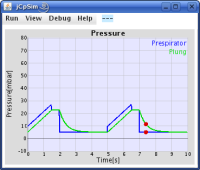 jCpSim is an open source simulation environment for physiological processes (like ventilation) and their interaction with therapeutic measures (like ventilator therapy). Java Runtime Environment (JRE), version 5.0 or later. You can also download the compiled software (jcpsim_0.2.02.jar) from SourceForge. (Double)clicking on jcpsim_0.2.02.jar will start the simulation on some operating systems. Can be used for teaching simple respiratory mechanics. Much more is planned for the future ('real ventilators', more complex models, circulation, pharmacokinetics, ...) - depending on my spare time. How can i stay informed about new versions of jCpSim? If you run jCpSim via Web Start and are connected to the internet you will always have the latest version. If you are offline Web Start will load the version you did use the last time. You can subscribe to the jcpsim-announce mailing list (very low volume). jCpSim is licensed under The GNU Lesser General Public License (LGPL). Piccolo is licensed under this license. 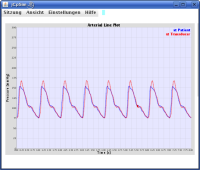 Chapter 16.2: Adaptive Stepsize Control for Runge-Kutta. You can download jCpSim_0.2.02_source.jar from SourceForge. You can access the latest code (possibly not working!) from SVN.